See Seattle Tall Poppy's take on a recipe from this book (includes sample recipe). I actually don't cook recipes directly from this book, but seem to go back to it over and over again for ideas - I do a lot of borrowing and tweaking from it, so it's a great resource for inspiration. Basic, simple oatmeal. The toasting is nice. Bland, not anything special. Perhaps okay as a way to cook black eyed peas you will then use in another recipe. I plan to use up what is left in cold salad with other ingredients. p. 140 – This was a satisfying, hearty dish for a chilly fall evening. The sausage is truly the star of the dish so it makes sense to use a well-seasoned, high-quality version for this dish. The addition of the cooking liquid is a must as the sauce is quite thick without it. Definitely a recipe worth repeating. Would work well with chorizo sausages as well IMHO. Also, tomatoes could be added to the sauce to mix things up a bit from time-to-time. Thanks Martha!! Making this during today's snowstorm, as I have (for some reason) many times in the past. I've made this for years and it's quite good. But I wanted to go further today... So I made a maple buttercream and layered in some blueberry jam. I think it worked. You really can’t go wrong with obscene amounts of maple syrup and butter. 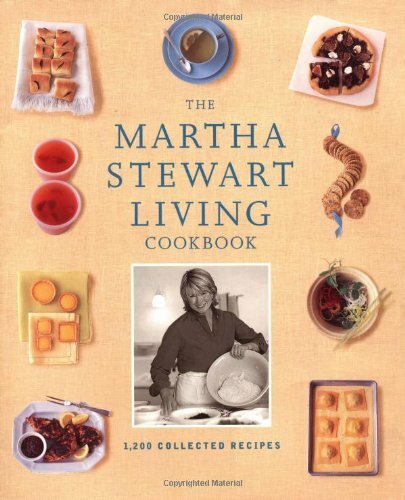 The food pages of Martha Stewart Living are among the best loved by its 2.5 million readers. Now, devoted fans of the magazine can find all their favorite recipes in a single volume. This book features chapters of hors d'oeuvres, vegetarian main courses, breads and biscuits, and recipes for a crowd, as well as traditional categories including soups, sandwiches, meat, poultry and game birds, and desserts, pies and tarts. Readers will also be delighted to find master courses - the signature 101s that are so popular in the magazine - for recipes everybody needs, including Spaghetti 101, Roast Chicken 101, Pizza 101 and Caesar Salad 101. Equally familiar and just as welcome are Good Things, tips and techniques for efficient preparation, expert cooking and effortless entertaining. A guide to ingredients, equipment and sources and a 32 page color insert help to make this book an indispensable collection for all of the magazine's - and all of Martha's - fans.